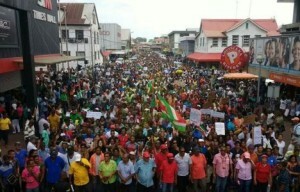 PARAMARIBO - For the second day in a row, several thousand disgruntled citizens marched in the streets of Suriname’s capital Paramaribo on Friday, calling on the Bouterse administration to reverse the recent fuel price hike. Trade unions took over the lead on Thursday and Friday, sending a strong signal to the government, with more than 10,000 people attending the rallies. While numerous demonstrators called on President Desi Bouterse to resign, union leaders said that such is not the main goal of the protest. Union leader Robby Berenstein noted that the objective is not to overthrow the government, but rather to press the administration to change its policies. “What has been done since the Bouterse-led administration came into to power in 2010 and again in 2015 has resulted in extreme hardship for the people,” said the union leader. He vowed that the demonstrations will continue until the “disastrous” measures have been reversed. Import revenues have fallen sharply since 2015 due to the steady decline on the international market of the prices of Suriname’s most important commodities: gold and oil. According to the government, the country’s income since 2015 fell by 70 percent in comparison to 2014. As a result, the country’s foreign currency reserves were nearly depleted, which led to a 20 percent devaluation of the Surinamese dollar in November 2015. “The government should not underestimate the signal we have sent,” said Berenstein. Meanwhile, the ministry of education announced that the principle of no work, no pay will be applied to teachers who participate in the demonstrations. Minister of education, Robert Peneux, argued that this month teachers received a salary increase of 500 Surinamese dollars (US$65), hence they have no reason to protest. Wilgo Valies, president of the Association of Teachers, described the measure as an attempt by the government to intimidate, adding that teachers will not be deterred or intimidated. “We will fight to the bitter end for a better life, better wages and better positions,” said Valies.